Everyone needs a basic recipe for German Chocolate Cake in their recipe box. Try ours for great results! Everyone needs a basic recipe for German Chocolate Cake in their recipe box. Ours is an easy, basic recipe that will satisfy hard-core chocoholics needs for sweetness. 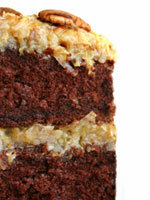 If you've never baked a German Chocolate Cake before, this is the one for you. When you do try this recipe for German Chocolate Cake, let us know. Or if you have your own favorite recipe for this cake drop us a line and share it with our readers! 1. Preheat oven to 350° F (180° C). Grease and flour two 8-inch baking pans. 2. In a large bowl, combine flour, sugar, baking soda, salt, butter, sour cream eggs, chocolate, milk and vanilla. Beat with a mixer at low speed until blended. Increase mixer speed to high and beat 2 minutes more. 3. Pour the cake batter into the prepared pans and place in the oven. 4. Bake for 35 minutes. Remove to racks and cool completely. 1. In a saucepan over medium heat, bring the evaporated milk, brown sugar and butter fo a full boil. Remove from heat and stir in coconut and pecans. Set aside to cool to room temperature. 2. When the cake is cool, place one layer on a serving platter. Spoon half of the coconut mixture onto the layer. Top with the remaining cake layer and top with the remaining coconut mixture.